As we perfumistas know, inspirations for scents rarely translate into realistic representations: "This perfume is SO Virginia Woolf!" That's fine...we can still enjoy the resulting perfume even if it's not catty, depressed, inhibited, or a genius. But why can't Nordstrom get the country house right in the PR above? The Bloomsbury area of metro London is NOT the country and the houses there associated with the Bloomsbury group are on Gordon Square. You have to travel 90 minutes outside London to see THE country house of the Bloomsbury set: Charleston farmhouse. Nordstrom: get some good copywriters and proofreaders! (You can afford them.) Certainly the Jo Malone sales assistant at Nordstrom who hesitated to give me a sample of Tobacco & Mandarin1 ("Let me spray some on a card for you to take instead! It won't leak in your beautiful bag!") knew nothing about Bloomsbury, the neighborhood or the group. Skip this paragraph if you're easily angered by disparagement of the Bloomsbury Group; because if you wanted to gather a collection of people guaranteed to annoy me, clone the entire tedious, self-conscious, entitled, emotionally childish, and pretentious bunch. Only Woolf, E.M. Forster, Roger Fry and Dora Carrington (a peripheral figure) get a pass — for talent. I'm not drawn to the cult of personality (or the "art and design") surrounding Vanessa Bell or Duncan Grant. What drew me to today's perfume were the words: "tobacco" and "mandarin." Tobacco & Mandarin starts with creamy mandarin that disappears almost the moment you smell it. Following the mandarin is honey-sweetened (but sheer) tobacco; the tobacco in Tobacco & Mandarin has no 'teeth' or muskiness. After those notes begin to fade you'll detect a clean vanillic musk that stays close to the body. This is all nice enough, but I've smelled this type tobacco fragrance many times before; I like tougher tobacco...and tons more mandarin. Jo Malone always presents interesting (often quirky) lists of notes for its fragrances. Over the last decade I've run to sniff the perfumes as they come off the assembly line and I'm always disappointed. Jo Malone is like the cook who sends you a sensational menu for a meal he's inviting you to, and when you get there all those exotic dishes taste like reheated frozen dinners. Jo Malone has a stingy (light) hand with "ingredients." But: that's just me! Jo Malone is a huge brand with a BIG fan base; if you're a fan-boy or -girl of Jo Malone, try this new collection quickly, it's limited edition. Jo Malone Tobacco and Mandarin Cologne is $70 for 30 ml. 1. Perfumer Yann Vasnier; listed notes of mandarin, tobacco leaf, sage, beeswax, coumarin. So I guess you’re not a fan? ???? I haven’t had much luck with JM either but I do have a decant of French Lime Blossom which I plan to wear tbe heck out of this summer. Petunia, you’re welcome…and you will go through that lime blossom in no time I bet…it was very fleeting on me. Sounds like its pretty much in line with the rest of her fragrances. I’ve learned not to expect much in the way of longevity or complexity from the brand – I suppose there are days where that sort of scent is just the ticket. Still, meh. Out of the entire range (and there are quite a few, eh? 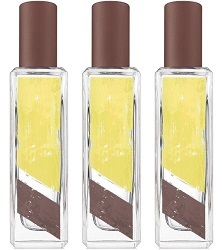 ), I’ve only purchased – and repurchased – Nutmeg & Ginger, her first scent. Say: and more and more seem to be limited editions. Kanuka…thanks…and love the sprinkles! Ha! Jo Malone is so frustrating to me because I do think many of their scents are very nice, but like you said they are stingy and they nearly always feel unfinished, like someone crafted a nice top and heart and completely ignored the base. There are a few of them I like (and I own a bottle of Black Pepper and Birch Tar–the only one of theirs I’ve tried that really had any lasting power). I think their Orange Blossom is good, and I really like Red Roses, but pssst, BPAL’s yearly Christmas-time LE “Rose Red” smells almost identical to JM Red Roses and is literally 1/3 the price. So. SHRUG. Lani, lots of folks mention the birch tar scent…I missed that one completely. I’ll have to make a note of the LE Christmas rose scent from BPAL, since I quite like Red Roses but never can convince myself to buy it for that price. Thanks for the tip, Lani! Um, and those bottles are NOT hand-painted. The original design may or may not have been, but those are just printed labels. lol. No kidding. They are so not good in real life. Amy, I was not a fan of the colors they used either. b) when the ad copy sounds enticing but the fragrance is disappointing? Also, Kevin, please remind me which tobacco fragrances you would recommend. Have you tried La Via del Profumo Tabac? I don’t remember it as having much projection or longevity, but it smells great, to my nose. Noz, I did like LVDP Tabac, I wear Fumerie Turque, Coqui Coqui Tabaco, coollife Le Quatrieme, SMN Acqua di Cuba…going blank. Ha! Love the copy. When Bloomsbury was last rural New York was still Nieuw Amsterdam. thank you for expressing all that I’ve been feeling about this. I fell for the idea of the notes, but no no no. Oscar de la Renta does a nice tobacco + citrus scent called Santo Domingo – not sure how it compares with this, but I’d recommend it to anyone who likes tobacco scents. nicolasix: a women’s tobacco…interesting. Have never come across it! It’s categorized as feminine, but I would describe it as unisex. I like it a lot in cooler months. Those bottles look eerily familiar–my first thought was that Kevin was reviewing the first Nagel Hermessence. With the current IFRA restrictions what are good citrus perfumes, mandarin or otherwise? monkeytoe: those bottles reminded me of another line too, and I could not remember for the life of me what it was. Good citrus scents are out there…just way harder to find than in the past. What on earth was going on with the Nordstrom copy? I predict that wherever you found the writing, it will be fixed shortly! As for your injunction, “Skip this paragraph if you’re easily angered by disparagement of the Bloomsbury Group . . .” I couldn’t…. even though I was warned! So just to have my say ( ), I think 25+ years ago I would have shared your sentiment… but now, I don’t know. I feel very nostalgic about a group of people who could hardly imagine WWII. Their beautiful, self-righteous intellect was transgressive, I’ll agree, because they could afford to transgress–but then many of them lost a great deal. Perfume? I really wanted to like this one…cigarettes and orange juice was an appealing thought. Oh well! Oakland: It was on nordstrom.com…the ad copy for this scent. Should look if it’s changed. HA! I liked the opening on this one (reminded me of Iunx L’Eau Argentine), but I was a good perfumista and waited until the dry down (money saved). I don’t know this brand very well, and don’t “need” any new bottles at the moment, but altogether, and for what you can find at a mall for $70, this set of fragrances did not appear to me that bad. schaf: I think $70 for 100 ml would be more reasonable for this. Kevin, have you tried any of the Cologne Intense line? I’m not a big JM fan, but there are several that I love in that group. (So I guess that does make me a JM fan after all. ????) Amber & Patchouli is wonderful. And I’ve recently fallen for Orris & Sandelwood. They both have great longevity. Laura: I have…I even bought Dark Amber and Ginger Lily at first sniff…and regretted it the next day. HA! It’s still staring me in the face in the perfume cabinet. I gave it to a friend who said she liked it…she returned it months later. Kevin you have hope! And that is a quality to be nurtured these days. Totally agree about Jo Malone though both generally and specifically about this one. They just go so flat I find. I am hoping to get to the Vanessa Bell exhibition at the Dulwich art gallery in deepest darkest south east London. It has good reviews and I do like that genre of art but (E M Forster aside) I suspect I would agree with you if I’d ever met them in the flesh even taking into account that generation’s difficulty post WW1 and pre WW2. Dona: yes, ever hopeful! Jo Malone and Atelier get me every time with these lists of notes!!!! I’ll admit that I fell for the Leather & Artemisia one from this group. It had something special in the opening that I’ve never smelled in any other fragrance, and it reminded my of doing art projects in second grade. (I know that’s very specific, but my second grade teacher was very into art so I had access to many of her supplies that I wouldn’t have used in other grades.) — I guess that’s really fitting for this line then! I wonder what the substance is that I detect? The Tobacco and Mandarin was my least favorite one. I didn’t smell and mandarin and the tobacco was kind of sharp, totally irritating to my nose. I immediately set it off to the side and moved on. It’s funny how I know right away with Jo Malone scents if I like it or not. I enjoy all of your reviews, but the best are the ones in which you don’t like the fragrance. I’m sorry that I root for you to hate something for the sake of my own entertainment, but…that’s where I have found myself. Thank you for this one! Lucy: if you continue reading NST, you will be pleased…my desk is full of rejects! HAHAHA! Lucy: PS — see?????????? Now I have to go sniff Leather & Artemesia…I’m so susceptible to things like: “…something special in the opening that I’ve never smelled in any other fragrance.” !!!!! !